Presence of mind, being truly awake and aware of this moment in our lives is perhaps the one universal spiritual practice. Deeper than any ritual, belief or tradition, being truly present to what is happening is to take hold of our lives here and now. The only real moment. The only moment in which we can actually change anything. Not surprisingly this level of awareness is never complete. There is always deeper we can go, more attentive to the subtleties of what is really happening, what is rising in us to meet the events that come towards us. The temptation to answer the moment out of habit and fear, patterns we have practised over a life-time is very strong. It happens below the level of everyday awareness, happens before we can get a grip on it. Sometimes it seems the more spiritual practices we engage in the more difficult it is to deal with the challenges of this moment, this relationship, this task-in-hand. Presence awareness, becoming grounded in Now is an important way to bring both inner and outer life into harmony. Sound Baths with Sounding Bowls can really help. Being grounded is a result of learning slowly to give up our desire to live up to the ideal of what we could or ‘should’ be, slowly learning to forgive ourselves for past failures, slowly learning that only being the simple best that is available to us now can make good of this life we are leading. Coming down in forgiveness like this creates love in our lives, in our surroundings. How can we best cultivate that? There are two directions in spiritual work: the Up & Out: discovering our eternal nature, our hidden beauty & Down & In: the work of bringing that beauty into a real and helpful relationship with the daily life we came here to lead. Most spiritual practices popular in recent decades have emphasised the Up and Out, possibly because self-discovery is essential to self-realisation and possibly because this is the more exciting direction requiring less hard work than Down & In. The major scale is the basis of all western musical experience and continues into other cultures as a hugely important part of music. The only reason this could be true amongst such vastly diverse peoples is a link into our fundamental nature. Toning the major scale is a recognised way of settling disturbances in the chakras and reflects in its intervals of whole and half tones the spaces we unconsciously feel around these centres of experience. Chakras are like eyes, they see into the invisible worlds both within and ‘outside’ us. In doing so they help us to balance the energies that approach us with those that arise in us, to balance what we bring to our lives with what we meet here. The seven principle chakras you will be familiar with are surrounded by many others. 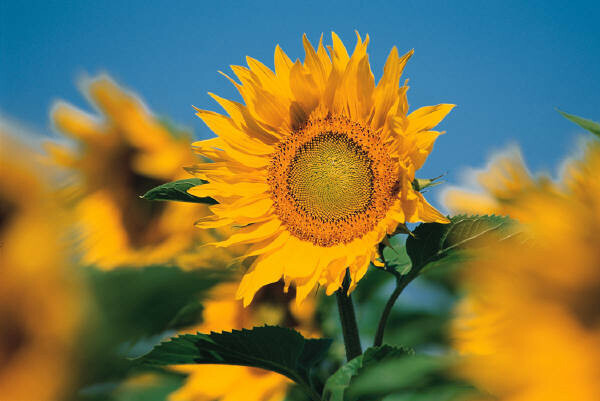 Toning the major scale takes us up through seven distinct notes to return to the first note an octave higher, from our base-in-the-body chakra to the base of all being, the ‘I AM’ of all humankind as reflected in the eighth chakra. Toning back down the scale to the start note is important as a return to self. Skipping the descending scale can leave you spaced out, returning to the base note, the start note returns us to our daily self. This action of grounding ourselves makes more effective in everyday life and there are ways to take it even further. Below the base chakra there are smaller chakras in the knees, the ankles and the soles of the feet. Such chakras as exist in all our joints. Depending on your habits these chakras grow or diminish. Someone who spends creative time on their feet will have strong, glowing foot-sole chakras just as an artist will have rich and healthy hand-palm chakras. Less common today is the glowing knee chakra, this is developed by a willingness to serve that was more common in the less individualised society of two or three centuries ago and before. The chakra in the soles of the feet is very important. Too often in our car-based society this chakra is somewhat wilted and needs deliberate care. The practice of grounding, walking barefoot on soil is rejuvenating as are certain martial arts but very many eastern spiritual practices actually unground us. Suitable as they were for the societies they developed in, too often the idealistic, spirit-gazing practices that bring us so much hope and refreshment also leave us disconnected from the here and now, from the ground we walk on in our daily, western life. Bringing life to this foot-sole chakra as to the knees and ankles as well can be done by toning on down from the start note of your major scale through the 7th and 6th to the 5th or ‘dominant’ note below the octave. Doing this without an instrument to accompany you is only really available to the musically experienced and though many people use recordings it is so really more alive and effective to use real sound. Any instrument that has those 11 notes will do but a stringed instrument is ideal. Sounding Bowls, with the rich overtones of an eastern meditation instrument and the tunable notes of a western instrument fill this need particularly powerfully. 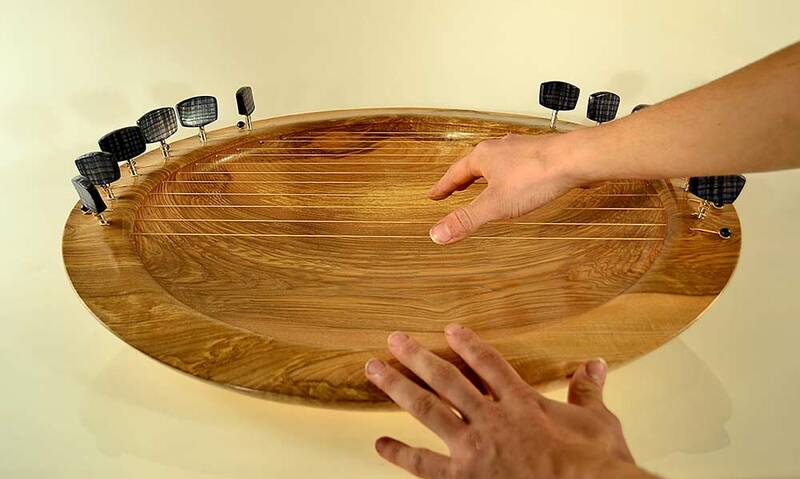 Those Sounding Bowls with 15 strings or more in the radiant pattern of the Lyre Bowl have been found to be so effective for this tuning, healing and grounding practice that they are commonly kept tuned to the harmonic chords of the major scale with the dominant note repeated three times as their deepest. You can hear this played on youtube here. Descending through the major harmonics right down below the key note to the dominant an drepeating that sole-of-the-foot-chakra note three times before re-ascending the scale seems to complete a refreshing wash of body and chakras while leaving people particularly well seated in the present moment. A Gong Bath typically takes 45 minutes are may even last hours. A sound bath with a Sounding Bowl takes only a few minutes. Just long enough to circle the body six or seven times, spiralling slowly upwards to finish over the crown chakra. If the feet are on a board resting the bowl’s edge on that board brings the vibrations right into the soles. If the chair has a wooden structure holding the bowl against the chair at intervals in the spiralling adds haptic vibrations into the air-borne sound and again increases the power of the sound bath. The instruction to anyone receiving the sound bath is always the same and very simple. ‘Just notice two things: notice the sound you are hearing, fill yourself with the sound, fall into it, become one with the sound and, as the sound fades notice the responses that arise in the body. It might be that you hear the sound inside yourself it might be something else that arises. When the sound bath is over sit with your inner responses as long as you like. Do not hurry to rise, do not feel any need to speak while you are absorbing what you have experienced. After the sound bath people frequently do want to share the experience but if you are the one giving the bath always make sure that people are set free from the usual social obligation to give positive feedback the experience will last longer, do more good if they have full permission to absorb silently. Later reports from people suggest that the experience is likely to last for days. The sound of the bowl can ring on in the inner life with extraordinary persistence. It is not unusual for a sound bath to form a turning point in someone’s life and then they may retain the sound at a level that they can tune into again even years later. Sounding Bowls are made with a deep honouring. The tree is honoured in the way the makers choose and handle the wood. The wood is honoured in that it is not cut into little bits and re-assembled but take as a single piece and hollowed out to the shape. The moment of making is honoured in that the quality of the cut is as valuable as the accuracy of the finished piece. And so on right through the process. 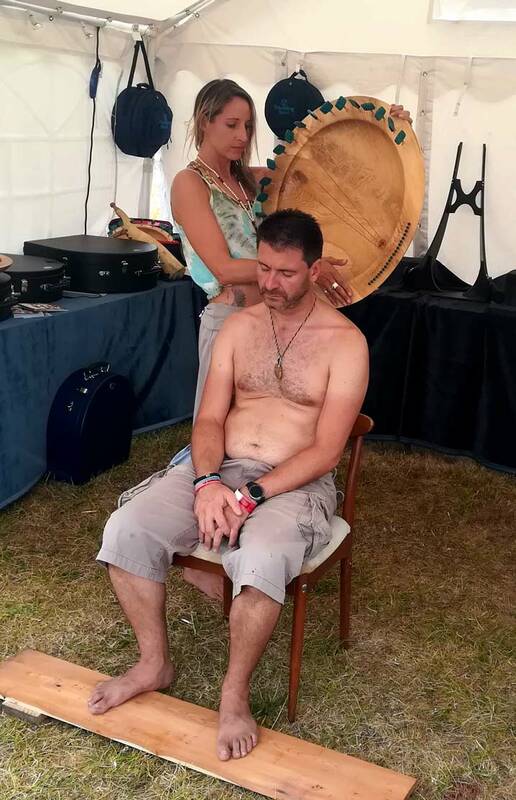 This level of deep attention fills the substance of the instrument and it is very common for recipients of Sound Baths or even those who simply get to hold and play one to feel honoured by the experience. Under these conditions it perhaps not surprising that giving someone a Sound Bath changes the way the world looks for them and can even change their life. Grounding ourselves in this life we came here to lead is always a positive move. Sounding Bowls help people to integrate heart and head and to ground themselves in their own being, their own potential.